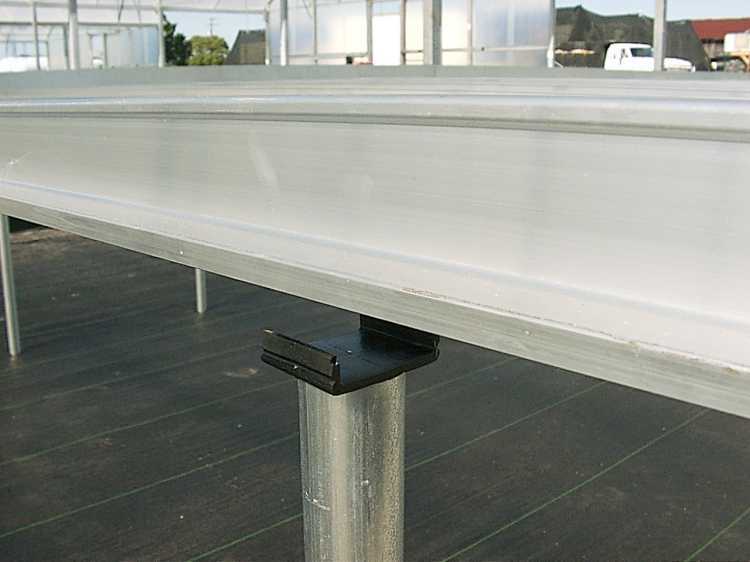 The t-rail is one of the simplest parts of the greenhouse but a clean installation is hard to achieve. Our snap on t-rail system makes for the cleanest and most tray friendly installation you could ask for. The steel posts are driven into the ground, usually through ground cloth, the t-rail adapter is pushed in and the t-rail snapped on. The post is galvanized, the adapter is unbreakable and carries a life of the greenhouse warranty and the t-rail is made of high strength aluminum alloy. This design allows personnel to access each aisle for tray and plant handling. 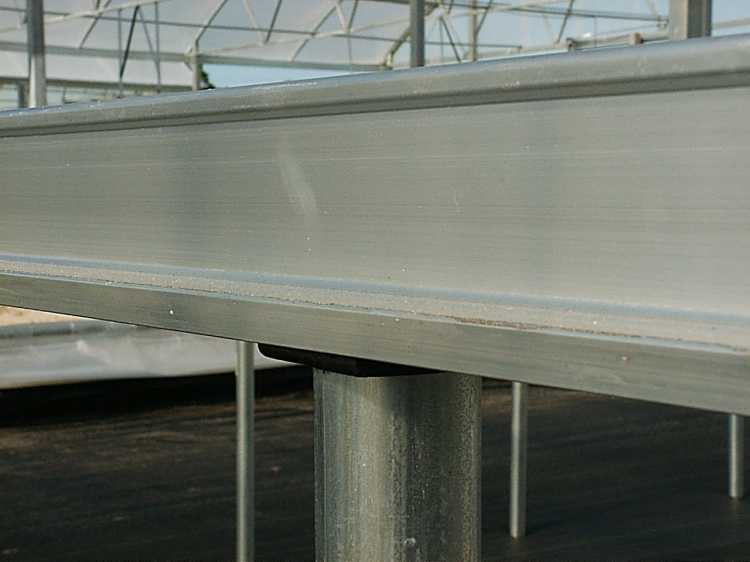 The t-rail is supported at the greenhouse wall by a supporting galvanized or aluminum angle. Ask us for proper spacing of posts and t-rail. This system is surprisingly affordable due to the lightweight design of the t-rail profile. We offer heavy weight translucent side curtains for commercial greenhouse operations which offer extended life in severe climates, reduced energy costs for heating and only about 10% shade effect for minimal effects on the crop when the curtains have to be left up for extended periods. They are surprisingly affordable especially when the the cost of replacing lower quality curtains more frequently is factored in. Let us quote your needs-no one has ever been dissatisfied with the material or workmanship. Sample swatches on request. Our side curtain accessories include cable, cable clips, dead eyes, pulleys and winches; both hand and power. 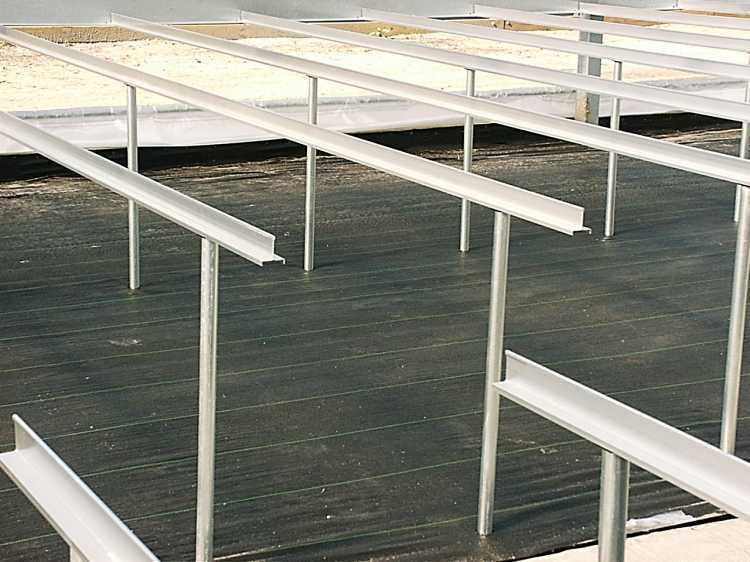 Germination rooms usually require some type of humidity control to prevent the seeded trays from drying out during the germination process. Our air over water fog system offers visible fog humidity control without excess moisture to prevent "raining" in the germination room. By using a sensor which "sees" the fog, high levels of moisture, near 100%RH may be maintained, in other words when the sensor can't see fog it turns the system on and when it does see fog it turns it off. The fog nozzles utilize a unique arrangement to prevent drips on startup or shutdown while providing true fog size particles of water. The control system allows variable time delay on time to start or stop the fog to prevent false cycling. The system operates on approximately 35psi air and water pressures allowing the use of pvc piping for low cost installation. Besides normal pvc tools all that is requred to install the nozzle system is a 3/8" drill bit and drill. 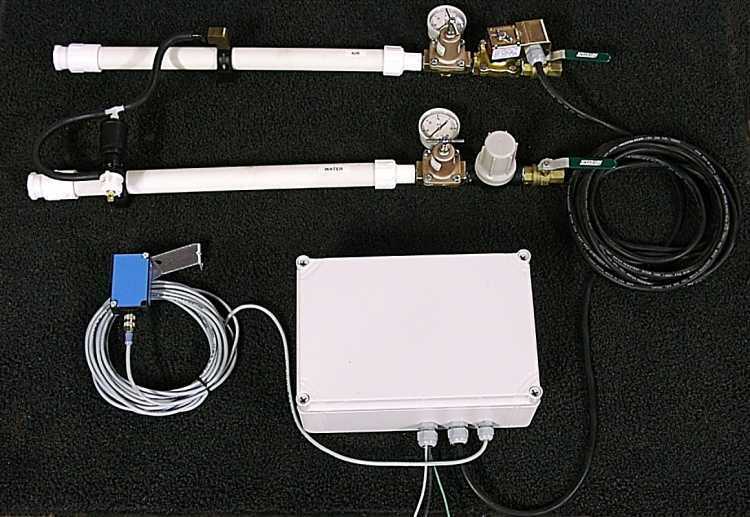 A standard 4 nozzle system uses about 14scfm air and provides about 8 gph of moisture added to the air. This system has been proven in rooms up to 1000 square feet in size. The system can be configured for 110vac or 220vac single phase power.